WEST LAFAYETTE, Ind. — Successfully pitch your unique business idea to a panel of judges, and you could earn a quick $1,000 in just two minutes. 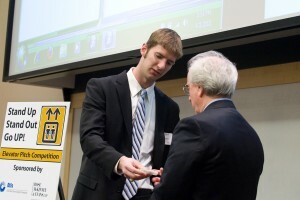 Registration is now open for the Certificate in Entrepreneurship and Innovation Program’s fifth annual Purdue Elevator Pitch Competition, slated for 2-5 p.m. April 8 at Discovery Park’s Burton D. Morgan Center for Entrepreneurship, Room 121. Purdue students and faculty, as well as entrepreneurs from the Purdue Research parks in West Lafayette and across Indiana, are eligible. Alumnae of the Certificate in Entrepreneurship and Innovation Program also are invited to participate. The competition gives each participant two minutes to describe a business venture to judges. Three minutes will be allotted for follow-up questions. Winners in each category receive prizes of $1,000 for first place, $500 for second and $250 for third. All competitors will receive T-shirts. Otis Elevator Co., law firm Bingham McHale LLP, Collegiate Entrepreneurial Opportunities from the Lilly Endowment and Purdue’s Discovery Park are sponsoring this year’s event. “This is a fun, high-energy competition that showcases the breadth of business ventures in the minds of students and entrepreneurs affiliated with the university,” said Nathalie Duval-Couetil, director of Purdue’s entrepreneurship and innovation program and associate director of the Burton D. Morgan Center for Entrepreneurship. Go online to http://www.purdue.edu/discoverypark/entr/competitions/elevator.php to register for the competition. For more information, contact Jeanette Greener, coordinator for the Certificate in Entrepreneurship and Innovation Program, at 765-494-1314, jgreener@purdue.edu. The program, led by the Purdue Office of the Provost and housed in the Burton D. Morgan Center, is available to Purdue undergraduate students in all majors. Its purpose is to make entrepreneurship an accessible career option by providing students with the skills and knowledge required to launch new business ventures.